'Alexander's Great' was found by Alexander Zukeivich of Belarus as a seedling in his garden and was introduced by Terra Nova Nurseries of Oregon in 2013. 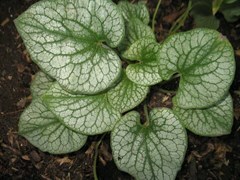 It is similar to Brunnera 'Jack Frost' but larger. It forms a large mound of heart-shaped, silvered leaves that have contrasting green veins and a narrow green edge. In spring it has stalks of small sky blue flowers that rise above the foliage. 'Alexander's Great' grows 1 to 1.5 ft. tall and 2 to 2.5 ft. wide. U. S. Plant Patent applied for and registered with the Canadian Ornamental Plant Foundation.